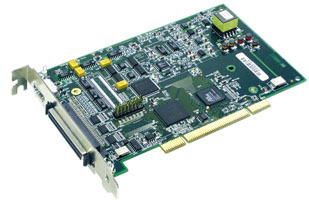 The new OMB-DAQBOARD-3000 Series comprises high-performance PCI boards offering 16-bit/1-MHz multifunction synchronous I/O at very competitive prices. This is accomplished by incorporating a high level of integration, while focusing on features that provide valuable benefits to users. The new OMB-DAQBOARD-3000 Series features a 16-bit/1-MHz A/D converter, 16 analog input channels (user expandable to 64), up to four 16-bit/1-MHz analog outputs, 24 high-speed digital I/O, 2 timer outputs, and four 32-bit counters. All analog I/O, digital I/O, and counter/timer I/O can operate synchronously and simultaneously, guaranteeing deterministic I/O timing among all signal types. Unique to the OMB-DAQBOARD-3000 Series is a high-speed, low-latency, highly deterministic control output mode that operates independent of the PC. In this mode both digital and analog outputs can respond to analog, digital, and counter inputs as fast as 2 µs; at least 1000 times faster than most other boards that rely on the PC for decision making. For end-users who would prefer the same functionality, but with a USB module, see the OMB-DAQ-3000 Series. Software support for the OMB-DAQBOARD-3000 Series includes support for Visual Studio and Visual Studio.NET, including examples for Visual C++, Visual C#, Visual Basic, and Visual Basic.NET, plus comprehensive drivers for DASYLab and LabVIEW. Also included is DaqView software for quick and easy setup and collection of data without programming, along with DaqCal software, an application for easy user calibration. The new DaqView software that is included with the OMB-DAQBOARD-3000 Series is a comprehensive application that enables setup, data logging, and real-time data viewing without any programming skills. The DaqView software also includes additional features such as direct-to-Excel enhancements, FFT analysis, and statistics. One 68-pin connector provides access to the 16SE/8DE analog input channels, 24 digital I/O lines, 6 counter/timer channels, and up to 4 analog outputs on each OMB-DAQBOARD-3000 Series board. An externally accessible HDMI connector is also provided on the OMB-DAQBOARD-3000 Series, enabling a simple connection for the optional OMB-OMB-PDQ30 analog channel expansion module. In addition to standard screw-terminal options for the OMB-DAQBOARD-3000 Series, the OMB-DBK215 BNC connection module can be used to provide screw-terminal access to all I/O, plus 16 BNC connectors that can be user configured. The OMB-DAQBOARD-3000 Series has a 16-bit, 1-MHz A/D coupled with 16 single-ended or 8 differential analog inputs. Seven software-programmable ranges provide inputs from ±10 V to ±100 mV full scale (single-ended ±10 V range on OMB-DAQBOARD-3006). Each channel can be software-configured for a different range, as well as for single-ended or differential bipolar input. The hybrid PGIA on the OMB-DAQBOARD-3000 Series is guaranteed to settle to the specified accuracy while operating at the full 1 Msample/s rate. Adding additional analog input channels for the OMB-DAQBOARD-3000 Series is easy using the optional OMB-PDQ30 expansion module. The OMB-PDQ30 connects to the OMB-DAQBOARD-3000 Series card via an OMB-CA-266-3 cable and does not occupy a PCI slot. The OMB-PDQ30 provides an additional 48SE/24DE analog inputs or 24 thermocouple inputs, software configured on a per-channel basis. The total channel capacity with an OMB-PDQ30 attached is 64 single-ended or 32 differential inputs. The measurement speed of OMB-PDQ30 channels is the same 1 Msample/s as with on-board channels. When configured to measure thermocouple channels, the system sample rate is 10 kHz per channel. This reduction in sample rate ensures that temperature measurements are accurate, low noise, and stable. The OMB-DAQBOARD-3000 Series also supports up to 4 boards installed into one PC, effectively quadrupling the number of channels that can be attached to one PC. The OMB-DAQBOARD-3000 Series can make analog measurements and read digital and counter inputs, while synchronously generating up to 4 analog outputs as well as digital pattern outputs. Additionally, digital and counter inputs do not affect the overall A/D rate because they use no time slot in the scanning sequencer. For example, one analog input channel can be scanned at the full 1-MHz A/D rate along with digital and counter input channels. The 1-MHz A/D rate is unaffected by the additional digital and counter channels. Many other data acquisition boards provide no capability to scan digital/counter channels along with analog channels, in which case digital and counter channels must be read asynchronously, which leads to a non-deterministic collection of data. The OMB-DAQBOARD-3000 has several scanning modes to address a wide variety of applications. A 512 location scan buffer can be loaded by the user with any combination of analog input channels. All analog input channels in the scan buffer are measured sequentially at 1 µs per channel. The user can also specify that the sequence repeat immediately, or repeat after a programmable delay from 0 to 19 hours, with 20.83 ns resolution. For example, in the fastest mode, with a 0 delay, a single analog channel can be scanned continuously at 1 Msamples/s; two analog channels can be scanned at 500 Ksamples/s each; 16 analog input channels can be scanned at 62.5 Ksamples/s. OMB-DAQBOARD-3000 digital inputs and counter inputs can be read in several modes. First, via software the digital inputs or counter inputs can be read asynchronously at any time before, during, or after an analog input scan sequence. This mode is not deterministic as to exactly when the digital or counter input was read relative to an analog input channel. In either of the two synchronous modes, the digital inputs and/or counter inputs are read with deterministic time correlation to the analog inputs. In the once-per-scan mode, all of the enabled digital inputs and counter inputs are read during the first analog measurement of an analog input scan sequence. The advantage of this mode is that the digital and counter inputs do not occupy an analog input time slot and therefore do not reduce the available bandwidth for making analog input measurements. For example, assume all 24 bits of digital input are enabled, all four 32-bit counters are enabled, and eight channels of analog inputs are in the scan sequence at the full 1 µs/channel rate. At the beginning of each analog input scan sequence, which would be 8 µs in total duration, all digital inputs and counter inputs will be measured and sent to the PC during the first µs of the analog scan sequence. In the other synchronous mode, digital inputs are scanned every time an analog input channel is scanned. For example, if eight analog inputs are scanned at 1 µs per channel continuously, and 24 bits of digital inputs are enabled, then the 24 bits of digital inputs will be scanned at 24 bits per 1 µs. If counters are enabled in this mode, they will be scanned at once per scan, in the same manner as in the prior example. The digital and analog outputs on the OMB-DAQBOARD-3000 can be updated asynchronously or synchronously in several modes. In the asynchronous mode, digital and analog outputs can be updated at any time before, during, or after an analog input sequence. The maximum update rate in this mode is non-deterministic and is entirely dependent on the PC processor speed, the operating system, and the programming environment. In the synchronous output modes, the outputs can be updated directly from memory in the PC, or as the direct result of an input from either an analog channel, digital channel, or counter channel. When updated from memory in the PC (via DMA), the rate by which the output can be specified in 20.83 ns intervals, and all outputs can be updated synchronously at a maximum rate of 1 µs. For example, all four 16-bit analog outputs can be generating different waveforms from PC memory with a 1 µs per channel update rate, while up to 16 bits of digital pattern could be generated from PC memory concurrently at the 1 µs per 16-bit update rate. Outputs can also be specified to update concurrently with inputs, so there is an exact timing correlation between inputs and outputs. The other synchronous method of output control is where an output, either digital or analog, is associated with any input—analog, digital, or counter. The state or level of the output is determined by the level or state of an associated input. For example, a digital output could be programmed to be a logic 1 when an analog input exceeds a certain value, or when a frequency input exceeds a certain rate. In addition, hysteresis can be programmed for each limit to ensure the output is stable near the transition point. Up to 8 digital outputs and 4 analog outputs can be programmed to respond to any analog, digital, or counter input. When analog or digital outputs are used in this mode, the user can specify two output values, determined by whether the input is above or below the limit. The slowest rate at which an analog output can respond to an input is 4 µs plus the time period of a scan sequence. For example, if 4 channels of analog input are scanned continuously at 4 µs per scan, then the maximum latency between an analog input satisfying a limit, and the output responding, is 4 + 4 or 8 µs max. The worst-case response time can also be improved in several ways. For example, if a digital output is correlated to a digital input, then the worst-case latency can be reduced to 2 µs total if all digital inputs are scanned at the 1 µs rate without a delay period at the end of each scan. In addition, an output status channel can be specified in the input scan sequence buffer so that users can correlate output state changes to their respective input channels within their data buffers and files. Adding the status channel takes no additional scan time and has no effect on the overall acquisition rate. The status channel can also be read asynchronously at any time during an acquisition for monitoring of the control outputs. The advantage of this mode is that the response time can be in the range of 2 to 20 µs, vs. 1000 or more microseconds when using other suppliers’ boards. (OMB-DAQBOARD-3000 and OMB-DAQBOARD-3001 only) Two or four 16-bit, 1-MHz analog output channels are built into the OMB-DAQBOARD-3000 Series with an output range of -10 V to 10 V. Through the use of bus mastering DMA, each D/A output can continuously output a waveform at up to 1 MHz, which can be read from PC RAM or a file on the hard disk. In addition, a program can asynchronously output a value to any of the D/As for non-waveform applications, assuming the D/A is not already being used in the waveform output mode. Lastly, each of the analog outputs can be used in a control mode, where their output level is dependent on whether an associated analog, digital, or counter input is above or below a user-specified limit condition. When used to generate waveforms, the D/As can be clocked in several different modes. Each D/A can be separately selected to be clocked fromone of the sources described below. The on-board programmable clock can generate updates ranging from once every 19 hours to 1 MHz, independent of any acquisition rate. Synchronous Internal Clock. The rate of analog output update can be synchronized to the acquisition rate derived from 1 MHz to once every 19 hours. A user-supplied external input clock can be used to pace the D/A, entirely independent of analog inputs. A user-supplied external input clock can pace both the D/A and the analog input. Twenty-four TTL-level digital I/O lines are included in the OMB-DAQBOARD-3000 Series. Digital I/O can be programmed in 8-bit groups as either inputs or outputs and can be scanned in several modes (see Input Scanning). Ports programmed as inputs can be part of the scan group and scanned along with analog input channels, or they can be asynchronously accessed via the PC at any time, including when a scanned acquisition is occurring. Two synchronous modes are supported when scanned along with analog inputs. In the first mode, the digital inputs are scanned at the start of each scan sequence, which means the rate at which they are scanned is dependent on the number of analog input channels and the delay period. For example, if 8 analog inputs are enabled with 0 delay period, then the digital inputs in this mode would be scanned at once per 8 µs, which is 125 kHz. In the other synchronous mode, the enabled digital inputs are scanned synchronously with every analog input channel. So in the example above, the digital inputs would be scanned at once per µs, or 1 MHz. If no analog inputs are being scanned, the digital inputs can be scanned at up to 12 Msamples/s. Digital outputs can be updated asynchronously at any time before, during, or after an acquisition. Two of the 8-bit ports can also be used to generate a 16-bit digital pattern at up to 12 MHz. The OMB-DAQBOARD-3000 Series supports digital pattern generation via bus mastering DMA. In the same manner as analog output, the digital pattern can be read from PC RAM or from a file on the hard disk. Digital pattern generation is clocked in the same four modes as previously described for analog output. The ultra low-latency digital output mode allows a digital output to be updated based on the level of an analog, digital, or counter input. In this mode, the user associates a digital output bit with a specific input and specifies the level of the input where the digital output changes state. The response time in this mode depends on the number of input channels being scanned and can typically be in the range of 2 to 20 µs. Four 32-bit counters are built into the OMB-DAQBOARD-3000 Series. Each of the four counters will accept frequency inputs of up to 20 MHz, and each counter channel can be configured in a variety of modes, including counter, period, pulse width, time between edges, or multi-axis quadrature encoder. The counters can concurrently monitor time periods, frequencies, pulses, and other event-driven incremental occurrences from encoders, pulse generators, limit switches, proximity switches, and magnetic pick-ups. As with all other inputs to the OMB-DAQBOARD-3000 Series, the counter inputs can be read asynchronously under program control, or synchronously as part of an analog and digital scan group based either on an internal programmable timer or an external clock source. The OMB-DAQBOARD-3000 supports quadrature encoders with up to 2 billion pulses per revolution; 20 MHz input frequencies; and x1, x2, x4 count modes. With only A phase and B phase signals, 2 channels are supported. With A phase, B phase, and Z index signals, 1 channel is supported. Each input can be debounced from 500 ns to 25.5 ms (total of 16 selections) to eliminate extraneous noise or switch-induced transients. Encoder input signals must be within -15 V to 15 V and the switching threshold is TTL (1.3 V). Power is available for encoders, 5 V at up to 500 mA. Two 16-bit timer outputs are built into the OMB-DAQBOARD-3000, each capable of generating different square waves with a programmable frequency range from 16 Hz to 1 MHz. Multiple DaqBoards per PC All of the features described for the OMB-DAQBOARD-3000 can be replicated with up to four OMB-DAQBOARD-3000s installed in the same PC. The serial number on each OMB-DAQBOARD-3000 is used to differentiate one from another, and a user-selected name can be assigned to each board for easy program documentation. When multiple boards are installed, all boards can be operated synchronously by designating one board as the master. All of the other boards are then slaves, and are synchronized to the master via the pacer clock, which is externally routed to the designated slave boards. Analog output channels are updated synchronously relative to scanned inputs and clocked from either an internal on-board clock or an external clock source. Analog outputs can also be updated asynchronously, independent of any other scanning in the system. Bus mastering DMA provides CPU and system-independent data transfers, ensuring accurate outputs that are irrespective of other system activities. Streaming from disk or memory is supported, allowing continuous, nearly infinite length, waveform outputs (limited only by available PC system resources). 참고: Each OMB-DAQBOARD-3000 Series board is supplied with DaqView software, software drivers and complete operator’s manual on CD ROM.